The final term is always an exciting one for any grade because our students are quite a bit more mature than the start of school, they have greater independence and more developed skills. Of course, there’s much more than what we listed but these are some of the constants that we have noticed over the course of our teaching careers. From last week’s newsletter, you’ll know that we are now in the Final Four…finishing the last four letters of our Alphabet. We’ve been working really hard on teaching letter names and sounds, correct letter formation when writing, and developing the children’s phonological awareness. Phonological awareness is important because it is an indicator of the children’s readiness for reading. When children have strong phonological awareness, that means they have an understanding that language is made up of sounds (phonemic awareness), syllables, rhymes and words. In class, we directly teach phonemic awareness (the ability to think about and manipulate speech sounds) and its accompanying skills of blending (c-a-t = cat); segmenting (cat = c-a-t); deleting (children repeat a word without the initial or final sound) (cat/ca- or -at) and substituting (children substitute different sounds in a word) (c-an/f-an/r-an/ra-t/s-at). This forms a large part of our Alphabet instruction. Although we will soon be finished this direct Alphabet teaching, we will continue to review the letters (particularly sound production). Our regular classroom activities such as Sharing, class discussions and Mystery Box Inquiry, all contribute to developing the children’s oral language (speaking and listening), a necessary part of a balanced approach to reading instruction, and are on-going for the rest of the school year. In addition, we will support the children in refining the children’s printing skills during their daily work, focusing on correct letter formation, shape and space between letters and words, and writing on the line. It’s also a time for us to explore literary themes. Our big literary theme in Kindergarten is Fairy Tales. We choose Fairy Tales as we believe it to be one of the most important genres of childhood literature, along with Nursery Rhymes and Folk Tales. In our daily lives, through our speech (idioms), books we read and pop culture eg., “If the shoe fits, wear it” (Cinderella), many references are made to Fairy Tales; and a firm understanding of these familiar tales is essential when discussing literary archetypes and characterizations, plot patterns and common themes to fully understand the subtle nuances in current literature. We’ve written more about Fairy Tales here. 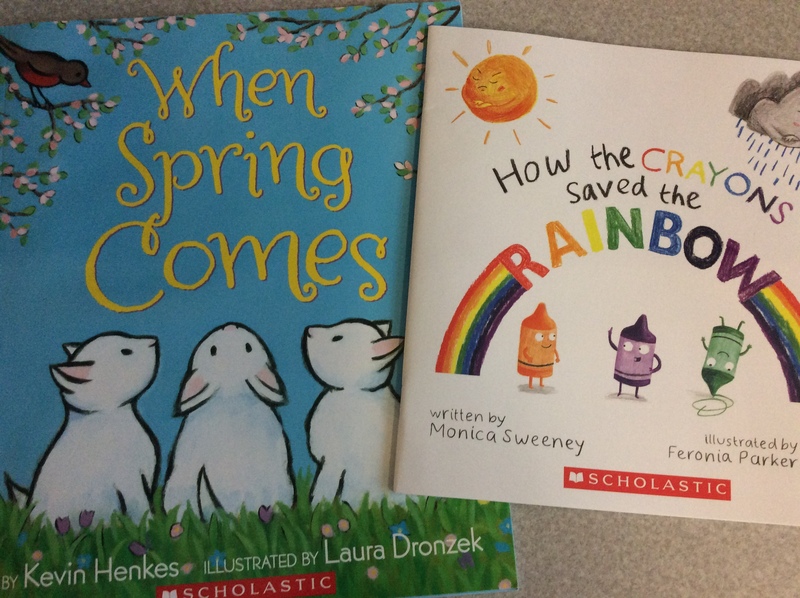 The next big literary event in our classrooms will be our Home Reading Program. This is a very fun and wonderful opportunity for our children to take home beginning readers three times a week, and read the books with you. We have home readers at a variety of reading levels. We will have the children read books at a couple of different levels, and report back which is “best” for them. We have been revamping our Home Reading Library and buying new books for the children with our Scholastic Bonus Money we earn from your purchases. So thank you to everybody who’s made a book buy this year! Home Reading will start at the beginning of May, following Student-Led Conferences on Thursday, April 26. As in all childhood development milestones, our children will achieve the reading and writing milestones in their own time, when they are ready and with interest, modeling, experience and exposure from the adults in their lives at home and school. Although most children will know most of their letter names, sounds and printing formations by the end of Kindergarten, not all children will. As parents and teachers, we want to support our children as best as we can. Although it is not a direct cause for concern at this time, it’s important to keep providing literary and language opportunities at home. For now, modeling reading and writing, read-alouds every night, taking the time to answer your child’s questions and reading environmental print are some manageable strategies which you can incorporate into your day. We will talk about more specific ways you can support your child’s literacy and language at home in the upcoming weeks. This entry was posted in Classroom Chatter, Curriculum by thekinderteam. Bookmark the permalink.